I’ve known Eric Kiraly since high school. We were in the same video production class during my later high schools years, and afterward attended the same University. Since college, however, Eric and I have been largely out of touch. But when Eric heard that I was planning to spend several months cycling around the Scandinavian country of Norway, he got in touch and asked if he might be able to join me for a portion of my travels throughout the country. At first, Eric and I planned to simply backpack around Norway together (as this would be the easiest and cheapest form of travel for Eric). 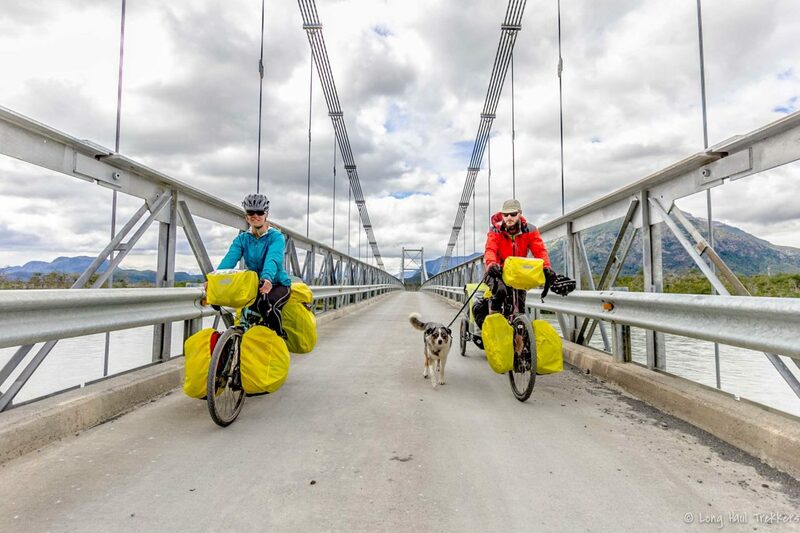 But the more I thought about it, the more I realized that traveling by bike might just be the best way for Eric and I both to experience the Norwegian way of life. I knew that Eric would struggle with camping every night and the lack of daily showers (which is the way I often travel when I’m on my own). So I looked into the possibility of participating in a guided or self-guided bicycle tour in the country. And that’s when I found Active-Norway.com and the various bike tours that they have on offer. Not only were their self-guided bicycle tours affordable, but they were located in some of the areas that Eric and I wanted to see most. After a short period of investigation, Eric and I signed up for not just one, but two, back-to-back bicycle tours with Active-Norway (also known as “Norske Bygdeopplevelser”). After I completed my solo bike tour from Copenhagen, Denmark to Oslo, Norway, I met Eric (who had flown in from Los Angeles, California earlier that day) at the train station in downtown Oslo. We jumped on an overnight train and in the early morning hours found ourselves in the beautiful city of Bergen, Norway. Because we arrived so early in the morning (sometime around 7 AM), Eric and I weren’t able to check into our hotel straight away – even though that’s what we both would have liked to do. Neither one of us slept very well on the train and we were both beyond exhausted! In order to kill some time, we hung out at the train station for a few hours, surfed the Internet, and then wandered into town to find our hotel around 10 AM. Active-Norway had arranged for us to stay at the Thon Hotel Bristol in downtown Bergen. This large, modern hotel is located on the main pedestrian square in the Bergen city center – directly over (and next to) one of the several McDonald’s in the downtown area. Lucky for us, the hotel had no problem letting us drop off my bicycle (which I had brought with me on the train from Oslo) and the rest of our luggage in their locked storage room. With our gear now secured, but a few more hours to kill before we could officially check into our room, Eric and I wandered around the Bergen city center, looking for something to do. The weather that first day in Bergen was quite cold and overcast. Despite the small sprinkling of rain we were experiencing, Eric and I decided to climb the steep hillside on the eastern edge of the city. From the top, we had an excellent view of the city below, with it’s old wooden buildings, towering modern cruise ships parked in the harbor, and the thousands of tourists running about on the streets below. Finally, around 2 PM, Eric and I were allowed to check into our hotel room, which was located on the corner of the building and from the windows gave us a superb view of the pedestrian square below us. After showering, Eric and I both crashed in the hotels beds and took a short nap. We were so incredibly tired! But we weren’t able to sleep for long. Around 4 PM, we had arranged for a local guide to show us around the city. This too was something that had been arranged for us by Active-Norway. The guide met us at our hotel and took us around the city, showing us all the important landmarks and answering any questions we happened to have. During our private tour of Bergen, Norway, Eric and I learned that all of the buildings in Bergen used to be built of wood. But because these wooden homes were built so close to one another and were so susceptible to catching fire, the inhabitants were not allowed to heat their homes with wood or even small candles. So the people of Bergen build their bedrooms in the center of their homes, using the space around them as a sort of insulation during the cold winter months. Our first full day in Norway was a pleasant one… and we slept well that night. In the morning, however, we jumped out of bed and began preparing for the first full day of our bicycle touring adventure. We ate a delicious buffet breakfast in the restaurant of our hotel… and then we packed up our bags (and my bicycle) for the short train ride to the nearby city of Voss (which is where our bike tour would officially begin). I was a little concerned that being a vegetarian in a country where fish and meat is such a common food, I might have some trouble finding enough to eat during my time in Norway. So I was relieved to discover that there were plenty of vegetarian foods on offer at the Thon Hotel Bristol and at the other hotels we would encounter throughout our Norwegian bicycle tour. After checking out of our hotel, Eric and I walked to a nearby bicycle shop, where we picked up the rental bike that Eric would be using for the duration of the bike tour. The man at the shop equipped Eric with a small, hybrid commuter bike with seven simple gears and a pink (almost salmon colored) helmet. I had a good time laughing at Eric and his pink helmet, but it was the only helmet the bike shop had that fit Eric’s head. After a short 2-hour train ride with our bicycles in tow, Eric and I arrived in the tiny lakeside village of Voss, Norway. Situated directly next to the train station was our accommodation for the night – Fleischers Hotel. We checked into our room (which was nautically-themed and had a view overlooking the lake and nearby mountains) and then prepared for dinner. After dinner, Eric and I took a short walk around the town of Voss. We meandered over to the nearby church, snapped some photos down by the lake, and strolled through the village, looking inside the empty shop windows and wondering how few people actually lived in this tiny town. Now well outside of Bergen, being surrounded my lakes and rivers and high, snow-covered mountains, Eric and I felt as though we were finally in the Norway we had imagined. We wandered back to our hotel that night, anxious and excited for the bike tour we would officially begin early the following morning. When we woke the next morning, we ate a delicious buffet-style breakfast at the hotel, changed into our bicycle clothes, carried our bicycles up from the hotel storage room where they had been locked overnight, and walked (not cycled) down to the nearby bicycle path. You see, this would be Eric’s first time riding a bicycle in a very long time. He knew how to ride a bicycle, but he had never ridden a bicycle loaded with two rear panniers, and he had certainly never cycled in a foreign country. Even though he was excited about the bike tour in front of us, I could tell he was a little frightened of how difficult it might be. So we took it slow at the start. We stopped several times to adjust Eric’s saddle, handlebars, helmet, etc… and then we slowly made our way up a long, ascending bike path that came to an end at the top of a large hill. On the other side of that hill was a steep and windy downhill descent to the massive roadside Skjervefossen waterall. At the top of the hill, Eric was afraid to cycle down the mountainside, fearing that it might be too steep for him – and he wanted to walk his bicycle down instead. But following close behind me, Eric could soon see that the road wasn’t as steep as he had imagined, and we whizzed past the waterfall with smiles on our faces. At this point in the bike tour, Eric was doing great. We were making good time, he looked strong and healthy on the bike, and there was a fork in the road. We could go left and cycle straight to the hotel… or we could turn right, cycle around the west side of Granvinsvatnet (a large lake) and then visit the tip of the massive Granvinfjord. Not wanting to miss any part of the tour (or an opportunity to see out first true Norwegian fjord), Eric and I chose to cycle around the lake and down to the tip of the fjord. It was a much longer bike ride around the lake than I thought it would be and the view from the fjord tip was not as spectacular as we both had hoped. So, by the time we got back to the road we needed to take towards our hotel, we were both a little tired. Unfortunately for Eric, however, this is where the most difficult part of the day (and maybe even the entire bike tour) was scheduled to begin. From the town of Ovre Granvin, we cycled for six long kilometers up a steep and windy mountain pass – a road that forced Eric to get off his bike and walk on multiple occasions. When Eric would ask me how far it was to the top, I’d lie and tell him that it was just around the corner, even though I knew there were still several kilometers to go. I could see the pain and suffering in Eric’s face and I was fearful that he might want to quit and turn around on the very first day of our bike tour! So I did what I could to keep Eric moving… and to my surprise, he kept a fairly positive attitude. When we finally reached the top of the short, but steep climb, Eric was elated – and exhausted! Climbing this 6 km hill may have just been the most physically demanding thing Eric has ever done. The best part about reaching the top of that hill, however, was that it was almost entirely all downhill from that point forward. The top section of the road took us through a dark, dense forest surrounded by small lakes and looming, tree-covered mountains. And then, suddenly, we reached a point in the road where we could see the village of Ulvik, the Hardangerfjord, and the hotel where we’d be staying that night just a short distance away. The bike ride down to tiny town of Ulvik was exhilarating. After such a difficult and demanding uphill climb just a few moments before, the downhill rush of adrenaline came at exactly the right time, and it was the perfect way to conclude our first day of bicycle touring in fjord Norway. Once in Ulvik, we went straight to our hotel (the Strand Hotel) and checked into our room. Situated on the edge of the Hardangerfjord, the Strand Hotel has a large outdoor deck, a giant dinning hall, and a plethora of small rooms looking out over the water. With only a few feet of land between the inside of the room and the cool water of the Hardangerfjord, it occasionally felt as though we were on a gently floating boat. One of the best things about participating in a guided or self-guided bicycle tour like the Active-Norway Biking Hardangerfjord bike tour is that after a full day of cycling, you know you can look forward to having a hot shower, a warm meal, and a comfortable place to sleep. And frankly, I’m pretty sure that’s what Eric was banking on when we arrived at the Strand Hotel after that first day of cycling. He was totally beat, and he was ready for a shower, a good meal, and a well-deserved rest. In the morning, Eric and I ate a delicious buffet breakfast in the hotel dining room, packed our lunches using the buffet food on hand, and then retreated to our room for a few more precious moments sitting in the patio chairs on the arm of the Hardnagerfjord. Knowing we had about 53 kilometers to cycle that day, we couldn’t lollygag for too long. We eventually packed up our bicycles, checked out of the hotel, and then made our way out of Ulvik, cycling along the edge of Hardangerfjord toward the town of Kinsarvik – approximately 30 kilometers away. The first part of our bike ride that day was relatively easy. The road was flat (for the most part) and the views were quite spectacular. Eric’s favorite part of the day, however, was when we cycled across the large Hardangerfjord bridge, which was only just recently opened (in August of 2013). My favorite part of cycling across the Hardangerfjord was the various art installations that had been put in place on both ends of the bridge. There were several areas in the tunnel leading to the mouth of the bridge where rainbow lights had been installed, and other large art installations were also scattered throughout the area. Now on the eastern side of the Hardangerfjord, Eric and I made our way along a somewhat busy road to the town of Kinsarvik. Along the way we’d occasionally have to stop and wait for the passing vehicles to back up and navigate around one another. You see, the road is so narrow in this part that two cars heading in the opposite direction from one another can sometimes not safely pass. So large trucks or RVs sometimes have trouble getting by the vehicles heading in the other direction. Kinsarvik was a beautiful and lively little town. When Eric and I arrived there, there was already a large line of people and vehicles waiting to take the ferry across the fjord. Eric and I jumped in the queue and waited. Following the instructions that had been given to us by Active-Norway, we were to take the ferry boat (with our bicycles in tow) across the Hardangerfjord to the town of Utne, and from there we were supposed to cycle 23 more kilometers to Herand, where we would need to catch the last ferry of the night to the city of Nordheimsund. The ferry from Kinsarvik to Utne was a fast and enjoyable experience… and on the water for the first time, Eric and I were able to see the Norwegian fjords in a way we had been unable to do previously on our bicycles. When the ferry boat let us off in the tiny town of Utne, it began to rain. Dripping wet, we pushed our bicycles up a steep, nearby hill to the Hardanger Folk Museum, which is an open air museum showcasing a number of old wooden houses from the region. Inside these old wooden homes are exhibits showcasing what it might have been like to live and/or work inside such a home in the centuries past. Traditional costumes, musical instruments, and a whole lot more could be found inside the various buildings that were on display here and open to the public. After being drenched by a quick and steady downpour, Eric and I did our best to quickly make it out of Utne. But getting out of town wasn’t as easy was we had hoped. There was a sizable hill in front of us, and it took some time to tackle this steep terrain. This was, after-all, only Eric’s second full day of bicycle touring… and he was still struggling with even the smallest of inclines. Once we got to the top of the hill, it was a largely flat, traffic-free road that we were cycling on. With the fjord on our right and the hillside on our left, Eric and I found ourselves biking through small, idyllic farms on which apples and cherries were being grown. As much as we enjoyed this flat, rolling section of the route, we needed to hurry because we knew there was still one large hill to climb that day, and we were in a rush because we needed to get on the last ferry of the day (at 5:07 PM), which would take us from the tiny town of Herand to the much larger city of Norheimsund, Norway. We arrived in Herand just in time and took the ferry over the Norheimsund, which was far from large, but it felt a lot bigger than the tiny towns we had been passing through for the last several days. It had been a long day and we were both quite tired, so we were pleased to discover that our hotel for the night was located directly next to the ferry landing. The Thon Hotel Sandven is a large, old-timey establishment on the outside, with a modern room room design on the inside. Smack dab in the center of Norheimsund, the Thon Hotel Sandven is just a short walk from the ferry landing, the supermarket, the bank, the local Maritime Museum and a number of other small local attractions. From our bedroom window, Eric and I had a beautiful view of the nearby fjord and the tiny homes that dot the hillside on the opposite side of the water. The WiFi was free and functional, and the friendly hotel staff we encountered at the establishment were both helpful and appreciated. When it came time for dinner, Eric and I took the elevator down to the dinning hall, only to find that the entire room (pictured above) was filled with Chinese tourists. There wasn’t a single spare seat in the entire establishment! Lucky for us, there was plenty of room in one of the nearby sitting rooms, so a table was set up for us, and we ate our delicious buffet dinner (pictured below) while seated at a table meant for six. Of all the meals I ate on the Active-Norway Biking Hardangerfjord bike tour, this one was probably my favorite. With so much food to choose from, a large plate and a hungry stomach to fill, I loaded up on bread, potatoes, salad and more! Even after I had finished eating and my stomach was more than full, I wanted to go back and get some more – to take to my room and eat at a later date. I didn’t actually do that (although I was tempted), but the food was that good! For dessert that night we had a large scoop of fruit salad (pictured above) and several small slices of fluffy, light, cream-covered cake. After dinner, Eric and I took a stroll around downtown Norheimsund (in an attempt to walk off the large meal we both had just consumed). While there was little to see in the city, we marveled at the beauty that surrounded us. As the sun set over the fjord, I snapped the photo above, which is a pretty good representation of what it’s like to travel in fjord Norway. Deep water, tall mountains, tiny homes, lots of boats, beautiful birds, and a vast array of colors. The third day of our Hardangerfjord bike tour with Active-Norway was a scheduled rest-day from the bikes. But instead of just sitting around the hotel all day and laying in bed (something I’m sure Eric would have enjoyed doing after his first two days of biking in a very long time), we were scheduled to participate in a guided glacier hike on the nearby Folgefonna glacier. To get to the glacier, Eric and I had to take a ferry from Norheimsund, back across the Hardangerfjord to Herand (where we had been the night before) and then take an hour+ long bus ride to the glacier parking lot, located high in the nearby mountains. Once we arrived at the glacier, we were quickly ushered into windproof pants, winter gloves, beanies, and ill-fitting sunglasses. Then, with a group of approximately thirty other people, we were instructed to walk out onto the snow covering the nearby mountain. Walking past a small local ski resort, we hiked up to the top of a snow-covered hill and were then split up into small groups of about eight people per group. We were then all tied together (like you’d see serious mountaineers doing in movies so that in the event that one of the adventurers were to fall into a glacial crevasse, the other mountaineers could pull the man out). For us, however, I think the ice axes we were carrying and the fact that we were all tied together with rope was largely for show. While I found the glacier hike to be far too touristy for my liking, others in our group found the experience to be both unique and enjoyable. I guess that for me, living in a ski resort that’s covered in snow for the winter months, hiking around for a couple hours on the snow-covered Folgefonna glacier was just another walk in the park. But for Eric (who has almost no experience in the snow) and so many others on the glacier hike that day, the experience was a positive one. After our glacier hike, Eric and I jumped back on the same bus that had driven us to the top of the mountain earlier in the day. After more than an hour on the bus, we jumped on the ferry yet again and traveled back to Norheimsund. But rather than stay in the same hotel that night, we were booked in a different hotel located approximately seven kilometers down the road. So, even though we were both pretty tired from our day on the glacier, we loaded up our bicycles and cycled the short seven kilometers to the nearby town of Oystese, Norway… where we checked into the Hardangerfjord Hotel. I really liked this hotel because, even though it wasn’t as fancy as the Thon Hotel Sandven we had stayed in the previous night in Norheimsund, it had a more relaxed atmosphere. After showering, Eric and I walked to the hotel dining room and were treated with another delicious buffet dinner. The following morning, after a tasty breakfast in the Hardangerfjord Hotel, Eric and I packed up our bicycles and mentally prepared ourselves for the longest day of our bike tour in Fjord Norway (Normally 66 km, but for us (because we were staying in Oystese and not Norheimsund), it was 73+ kilometers). Lucky for us, our longest day on the bike was also one of the easiest. There were no big hills to climb… and Eric was really beginning to get into his stride at this point in the bike tour. Like so many people who are new to bicycle touring, it takes a few days to really get into a rhythm. 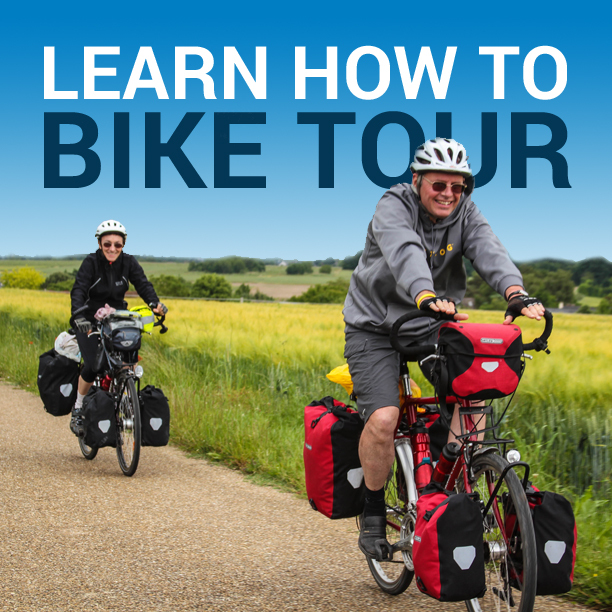 And like I say inside The Bicycle Touring Blueprint, it is usually on day three or four that most people begin to get comfortable traveling long distances by bike. In addition to this being Eric’s first bike tour, he was riding a rental bike that had a serious problem with its bottom bracket. Every time Eric would spin his feet around the pedals of his bike, the bottom bracket would crack and click, making the most horrific of sounds. Unfortunately, we only discovered this problem after we had left Bergen and were far from the rental shop where we had picked up the bike. Eric, however, was content with the bike he had been given… and he did a good job ignoring the horrible sounds that were emanating from the frame of his crappy rental bike. On the first day of the Hardangerfjord bike tour, Eric would stop riding his bicycle practically the moment he saw even the slightest uphill in the road ahead, and he’d be tempted to walk his bike instead. But on this, the third day of cycling, I began to see some real improvements in the way Eric approached his time on the bike. While there were no major hills to tackle this day, there were a number of small, rolling hills to climb, and I could see great improvements in how Eric approached these small hills. Rather than getting off to walk the moment he saw an incline, Eric would occasionally copy what I did and rise on his pedals so as to propel his bike up and over the small hill that was in front of him. While I had imagined a bike tour across Norway would be quite warm during the summer months, that wasn’t how things were in reality. For most of the tour, Eric and I were wearing our rain jackets. Even though it didn’t truly rain all that often, the air was cold – bordering on warm for just a moment, and then dipping back to nearly freezing-cold temperatures. We found that, on most days at least, wearing just our light rain jackets was the best approach for cycling in the cool Norwegian climate. When you cycle with another person, you have to learn how they like to ride and what motivates them to keep going. I’m a fairly experienced cyclist (having ridden my bike across 50+ countries all around the world, with more than fifteen years of long-distance bicycle touring experience), but my travel partner for this trip was a total newbie. You might think that traveling with a noob might be frustrating for me, but I found it to be an overall enjoyable experience. I would usually ride in front of Eric, which motivated him to keep going and catch up to me. When I got too far ahead, I’d simply pull over to the side of the road and wait. This extra time allowed me to rest, take photos, and/or listen to music/podcasts on my smartphone. Most of the time we spent cycling along the edge of the Hardangerfjord felt like cycling along the edge of a really big lake. But there were moments when we’d come across a particularly steep rock face that plunged deep into the water, and it was in these moments that we knew we were in Fjord Norway. At the end of our longest day of cycling, Eric and I pulled into the tiny town of Rosendal… and even from a distance we could tell that this place was something special. The air was cold and the sky was dark when we found our hotel and went inside to check into our room. But outside, the mountains called and I wanted nothing more than to climb to the top of the nearby peaks and look down on the fjord… and village… and islands below. Little did I realize at the time, but I would later have that opportunity! Walking into the historic Rosendal Turist Hotell, I couldn’t at first find anyone to check us in. I walked around the hallways of the hotel in my cycling clothes and searched for someone… anyone… to help us. Finally, a tall, beautiful, blond-haired young woman named Astri came walking up the stairs. “Do you work here?” I asked. It turned out she did! Astri checked us into room #5 (a large room situated near the front deck of the hotel) and then showed us a place in the basement where we could lock up our bicycles. The Rosendal Turist Hotell is unique in that the rooms of the hotel do not have their own private baths. Instead, all guests of the hotel must share one of the bathrooms located in the hallway. I was a little fearful of this setup when I first read about it in the Active-Norway paperwork, but it turned out to be a perfectly suitable way to spend the evening. After showering, Eric and I went down to the hotel restaurant and ate dinner, where we were served by both Astri (the beautiful young woman who had checked us into the hotel earlier that day) and a co-worker of hers named Luis who was from Spain, had lived in Cuba, and was now managing the Rosendal restaurant during the summer months. When Luis heard about my travels by bike, he was quick to inform me that he had conducted his own self-supported bicycle tour in Cuba, and that he had even been featured in an art gallery where they displayed photos and memorabilia from his bike ride across the country. The next morning, I woke up late and was unsure as to how I might spend the day. It was the second and last official rest-day of our Active-Norway bike tour… and knowing how much Eric wanted to just lay in bed and sleep, I decided that I was going to go off on my own and climb the nearby mountain. Lucky for me, the weather that day was the best I had seen since arriving in Norway more than a week before, so when I go to the top of the mountain, I was totally blown away by the views down below. The hike up to the top of Malmangernuten was not an easy one. The terrain was wet and muddy and steep. But the air was cool, the sun was out, and there wasn’t another soul in sight. Even before I was half way to the top of the mountain I could tell that I was going to be treated with some truly spectacular views. Because I was hiking alone and didn’t have anyone to take my photo, I laid my backpack down on a pile of rocks and then placed my camera on top of it. After positioning the camera as best I could, I set the timer and ran into the place. I did this several times, and the result of all that back and forth running is what you see in the photos here. If I had had another person with me who could have held the camera in a better (higher) position, I think the photos might have been even more breathtaking. One of the best things about this hike up to Malmangernuten was that I got to see Norway in the way you often see it advertised on TV, the Internet, etc. Only from up high was I able to see Norway in the way I had imagined it. From down below, on the edge of the fjord, Norway didn’t seem nearly as extraordinary. Yes, the views from the road where Eric and I had been cycling were quite nice. But only from up high could I truly appreciate what makes traveling in Norway so incredibly unique. After taking a bunch of photos of myself at the summit of the mountain, I walked a short distance east along the mountain ridge and came across a large family. Two parents with four or more young, blonde-haired children were also hiking this remote mountain trail. We crossed paths, said hello, and continued on our way. At the back of the group, a small boy (the youngest perhaps) had fallen and cut his knee on a rock. His mother ran back to inspect the wound (which was incredibly small) and comfort the small child. At the top of Malmangernuten was a large pile of rocks, and inside this pile was a big, metal briefcase. Inside the briefcase was a notebook and a pen where hikers (like myself) could write down their name, the date of their visit, their country of origin, etc. I added my name (and website, of course) to the notebook and then continued on my way. After reaching the summit of the mountain, I still had a long way to walk before getting back to the Rosendal Turist Hotell, where Eric was surely waiting for me. But instead of going back to Rosendal on the same trail I had hiked up on, I walked east along the mountain ridge. After about 40 minutes, I reached the edge of the mountain ledge and began making my way down a muddy mountainside, which lead down into the valley you see in the photo below. At several points along the trail there were ropes tied to trees… and these ropes were there so hikers could hang onto them as they navigated the steep, wet, and slippery terrain. A fall from here could be deadly, so the ropes were greatly appreciated! I swung like a monkey from the trail-side ropes and quickly bounced down the trail to the gravel road at the valley floor. From there, I walked for another half hour or more, back to Rosendal and the Turist Hotell, where I found Eric still in bed. He had only left the hotel for a brief moment the entire day (to inspect the nearby tourist center on the other side of the road). Otherwise, he had spent the entire day sleeping and/or playing on his smartphone. Meanwhile, I had been on an epic adventure! It was only about 5 PM at this point in the day, and I had been told (by the woman at the Rosendal Visitor Center) that there was a park nearby filled with some kind of massive stones. Rosendal is a small town, with not a whole lot to do, so a visit to the “Steinparken” sounded like a good idea. I forced Eric out of bed and we walked from the hotel to the nearby park. Once there, we made a quick loop of the area, taking more interest in the park swings and see-saw than the actual stones around which the park is centered. The next morning, after another delicious breakfast and dinner at the Rosendal Turist Hotel, Eric and I packed up our belongings, loaded up our bicycles, and began cycling south. The first part of our bike tour with Active-Norway.com (the Biking Hardangerfjord Self-Guided Bike Tour) was now officially over… and the second part of our trip (Around Sunnhordland by Bike and Boat) was about to begin. We weren’t sure how the two bike tours might differ from one another (or if they would at all), but we continued on, looking forward to the days we had in front of us. The first day of the Around Sunnhordland by Bike and Boat tour was an easy one. We made good time, and around half-way to our destination for the night, Eric and I ran into a group of four other people traveling on bicycles. When I saw the bikes these four individuals were riding, I instantly knew that they were also traveling with Active-Norway, because they were riding the same model bikes as the one Eric was using! Eric and I introduced ourselves and rode with the group for several kilometers. We later met them at our hotel – the Skanevik Fjordhotell in Skanevik, Norway. The Skanevik Fjordhotell is a large, aging building that looks like it might have been built out of the remains of an old school, a hospital, or a nursing home. The rooms were nice, but far from impressive. The tiny town of Skanevik was nice to walk around, but there was really not much there other than a supermarket, a few small shops, and the harbor where several small boats were docked. After showering, Eric and I took a stroll around the town and then returned to the hotel restaurant just in time for an early dinner with our fellow bicycle touring companions. The six of us were the only people in the entire hotel! In the group with us was Keith and Kate (from the United States) and Kevin and Jane (from the United Kingdom). While we ate, we spoke about where we were all from, what we did for a living, what we thought of the bike tour thus far, and a whole lot more. I shared how I had been traveling around the world on my bicycle for more than fifteen years, how I had written four popular books about cycling, how the website I built (BicycleTouringPro.com) is largest internationally-read bicycle touring website in the world, and how I had convinced Eric to come to Norway and join me on this wild and crazy (yet oh-so rewarding) adventure. While many of the hotels on the Around Sunnhordland by Bike and Boat tour expressed concern about serving me something good for dinner because I am a strict vegetarian and have been my entire life, there was no single meal on the tour that left me feeling hungry or disappointed. At the Skanevik Fjordhotell, for example, I was served a delicious plate of mixed vegetables, as well as bread and dessert. I was more than happy with that! The next day was a unique one for not only this bike tour, but for any bike tour I have ever done. Rather than start in one location and end in another, the second day of the Around Sunnhordland by Bike and Boat tour was an out-and-back day, meaning that we would start cycling in Skanevik, pedal approximately 27 kilometers to the nearby town of Etne, and then cycle back to Skanevik on the same road we had just traversed. I was sure that with this being an out-and-back day of bicycle touring, Eric might be tempted to simply stay at the hotel and skip the day of cycling all-together. So I was surprised when, in the morning, Eric said that he was going to join me on the ride that day. I was even more surprised when Eric completed the full 54 kilometers of riding that day. Even though we left the hotel a couple hours after the others in our party, we did eventually make it to Etne, where we turned around and pedaled back to Skanevik, just in time for our ferry boat over to the nearby town of Leirvik. I think Eric was pretty proud of himself for having completed the full day of cycling… and I was pretty proud of him as well. Once in Leirvik, we walked our bicycles with Kevin, Keith, Kate and Jane to the nearby Grand Hotell – a large, rectangular building located just a few short steps away from the ferry landing and the main pedestrian city center. When it was our turn, I calmly asked for the key to our hotel room, carried our loaded bicycle panniers up a single flight of stairs, and then sprawled out inside the massive room we have been given. There was not only a large bed to sleep on in the room, but a small desk and a sizable dining/lounge area as well. We were in paradise! That night, the rest of our group went out to eat at a fancy, local restaurant, where they were served food by one of the best chefs in all of Norway. Eric and I, on the other-hand, went to a Turkish fast food shop and ordered two large pizzas, which we carried back to our hotel room and consumed while surfing the Internet on our smartphones. After a buffet breakfast at the Grand Hotell the following morning, Eric and I jumped back on our bicycles and began cycling out of Leirvik. The others in our group had long-ago left the hotel and were far ahead of us, or so we believed. It was to our great surprise, then, when Eric and I suddenly stumbled across Kevin, Keith, Kate and Jane. We had caught up to them… and they allowed us to tag along with them for a while. In Sandvikvag, Norway, the six of us took a ferry boat over to nearby Husavik and then cycled up a short, but steep hill… across a long, windy bridge… and down into the tiny town of Bekkjarvik. Our accommodation that night was the charming and elegant Bekkjarvik Gjestgiveri. From the outside, the white walls of this old, seaside building screamed of ancient times gone past. But on the inside, modern interiors decorated in a nautical theme made us feel instantly at home. There were hundreds of large and small sailboats docked in the harbor opposite the hotel and our group (like the night before) was quick to check into their rooms. Eric and I must have received the largest and most impressive of the rooms on hand, as we were given room #1 – a massive quarters located right on the edge of the pier, with impressive window views looking out to the sailboats floating in the harbor. Our accommodation at the Bekkjarvik Gjestgiveri had two bedrooms and five total beds, with a dining area, a seating/reclining area, a small kitchen, and (of course) a sizable bathroom. After yet another delicious dinner with our fellow bicycle touring companions, Eric and I took a short walk around town, strolled down by the water, investigated the numerous sailboats in the area, and then went back to our room for a good, long sleep). After so many wonderful days of bicycle touring in fjord Norway, we woke the following morning, both excited about the day ahead of us, but also somewhat disappointed that this was going to be our last full day of bike touring in Norway. After a buffet breakfast at the hotel, Eric and I cycled away from the Bekkjarvik Gjesgiveri on our own. Like the days before, the others in our party had gotten an early start and were way ahead of us. Cycling back across the bridge we had crossed the previous night, we cycled north across Huftaroy island on highway 154 – a small, lonely road with beautiful forest views looking out across the ocean to several of the nearby islands. When we reached the town of Storebo, I realized that there were still several hours to kill before our scheduled ferry boat back to Bergen, Norway. Not wanting to go straight to the ferry and just wait there for several hours, I decided that I would turn left (alone, without Eric) and cycle an additional 20 kilometers out onto a series of small islands (via road 546). Eric, then continued on his own the few kilometers to the ferry landing and waited for me, while I cycled like a man man across eight or nine small islands, only to reach the end of the road, turn around, and cycle the same 20 kilometers back the way I had just come. While there was nothing spectacular to see or do on those small islands, I can now say that I cycled across eleven different islands in a single day. Pretty impressive, right? At 3:05 PM, the express boat arrived at the Storebo ferry landing. All six of us loaded our bicycles on-board and took a seat. Over the course of the next fifty minutes, we were quickly ushered back to Bergen, which is where our big Norweigan bicycle touring adventure began more than ten days prior. Bicycle touring in fjord Norway was a wonderful experience and I would recommend it to anyone with even the smallest interest in this beautiful part of the world. Traveling by bike is a great way to see the country, and the tours that Active-Norway has designed are the perfect mix of scenic cycling, delicious meals, and wonderful accommodations. While I enjoyed the bicycle touring experience more than I can say, what I am even more impressed with is how much my friend Eric improved over the course of those ten short days. At the start of the bike tour, Eric didn’t even know how to get on his bike properly (he was trying to sit on the bike and then pedal it, rather than pedal the bike and then sit down). On the first day of the tour, I know he wanted to quit about a dozen different times, but he just kept going. And there were times at the start of the tour when he’d see a big hill and instantly jump off his bike and begin to walk. But as the tour went on, Eric’s abilities on the bicycle greatly improved. He learned to shift gears properly, stand on the pedals and push with extra force when necessary, and by the end, he was riding over large hills like a pro! Thank you Active-Norway.com for a wonderful bicycle touring adventure. Your Biking Hardangerfjord and your Around Sunnhordland by Boat and Bike tours are both well-designed and enjoyable. I’ll be telling my friends, family, and readers about your tours for months and years to come. More than anything, congratulations to my friend Eric, who just completed his first bike tour. Congratulations Eric! You did it!!! I hope, that at some point in the near future, you’ll consider doing another bicycle tour (either close to home or in some other foreign land). You made so many incredible improvements on this trip. If you could just keep improving, who knows where you might be in one year, five years or ten years from now. Keep up the good work my friend… and I hope to see you again sometime soon! This entry was posted in Bicycle Touring Pro Articles, Darren Alff's Bike Tour Blog, Europe, Featured Articles, Locations, Main Articles, Norway, Photos and tagged active norway, active-norway.com, bike tour, biking hardangerfjord, cycle tour, cycling hardangerfjord, cycling norway, eric kiraly, featured, fjord, folgefonna glacier, hardangerfjord, hardangerfjord norway, Malmangernuten, norheimsund, norway, norway bike route, norway bike tour, norway cycling tour, rosendal, self-guided bicycle tour, sunnhordland, sunnhordland by boat and bike, ulvik. Norway looks perfects for those of us who love sleeping in hotels/motels and EATING! The food looks yummy! And the beds look comfy! I really enjoy seeing the beautiful photos from your journeys and these are confirming that Norway shall be our next big trip in 2016. Heading there myself on Friday for my first tour! These pictures are just growing the anticipation. Fotos are beautiful. Some of the landskapes looks like Bosnia. You can see similarities on my F.page, Bosniabybike, from my last tour through my Bosnia & Herzegovina. So long my friend and see you in the road!